The 2012-2016 California drought was unprecedented in severity. 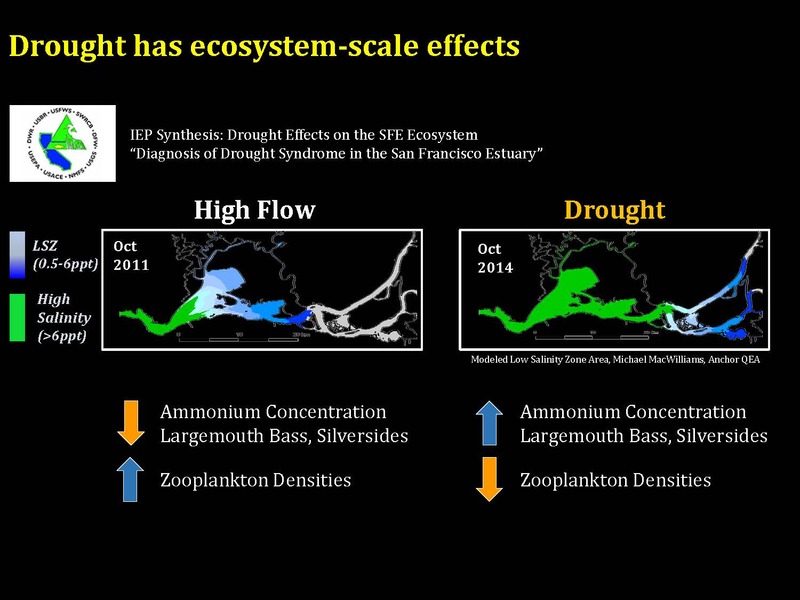 In the San Francisco Estuary, the drought was characterized by elevated nutrient loads, depressed zooplankton densities, enhanced Microcystis blooms, and an expansion of invasive aquatic vegetation coverage. Did wet conditions in 2017 allow the system to return to pre-drought conditions? Furthermore, has the capacity for drought resilience in the SFE changed over the last 5 decades during which we have been collecting ecological data? The Interagency Ecological Program (IEP) is a consortium of State and federal agencies that has been conducting cooperative ecological investigations since the 1970s. The IEP relies upon multidisciplinary teams of agency, academic, nongovernmental organizations, and other scientists to conduct collaborative and scientifically sound monitoring, research, modeling, and synthesis efforts for various aspects of the aquatic ecosystem. 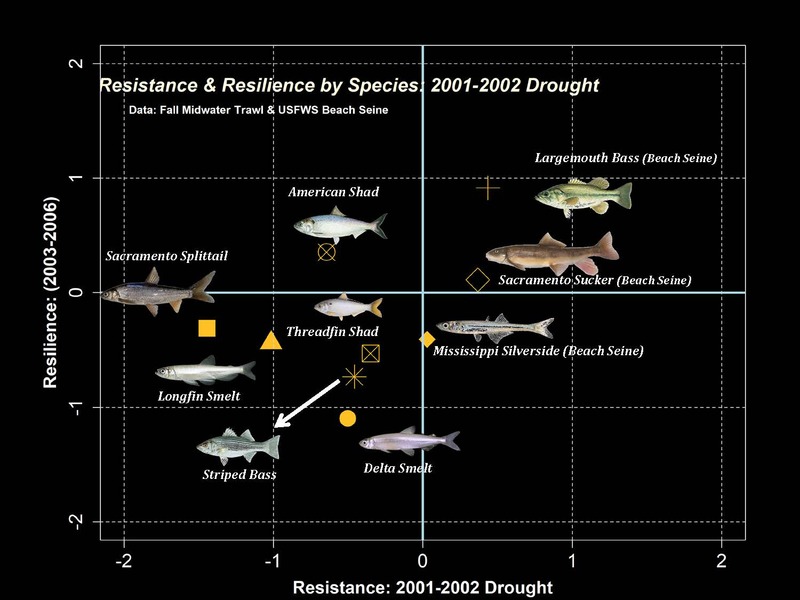 To assess the questions about drought resistance and resilience, an IEP research team drew on the long-term IEP datasets from the Fall Midwater Trawl and Delta Juvenile Fish Monitoring Program beach seine data to assess patterns in the likelihood of presence for eight fish species across five drought cycles, spanning a 51-year time series from 1976 to 2017. They developed Bayesian-based indices of drought resistance and recovery to assess patterns in the ability of species to both resist the drought stressor and to recover once wet conditions returned. These results are informative to management, as a return to wet conditions after drought now may not allow for the same level of population rebound as may have occurred under historical conditions. Dr. Louise Conrad is Program Manager for Estuarine Science and Synthesis with the Department of Water Resources and one of the researchers working on the IEP team. 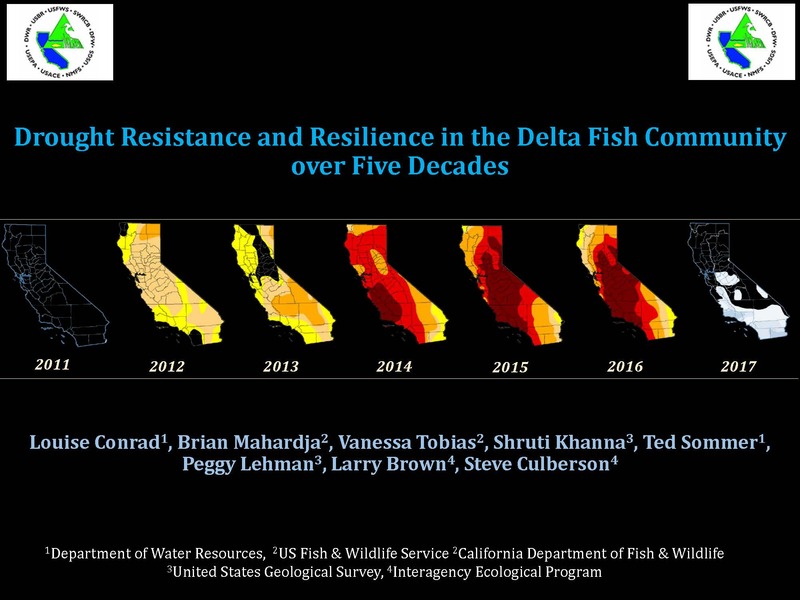 She gave this presentation at the 2018 Bay Delta Science Conference to highlight some of the results of their research. The IEP has looked at what happens during drought. 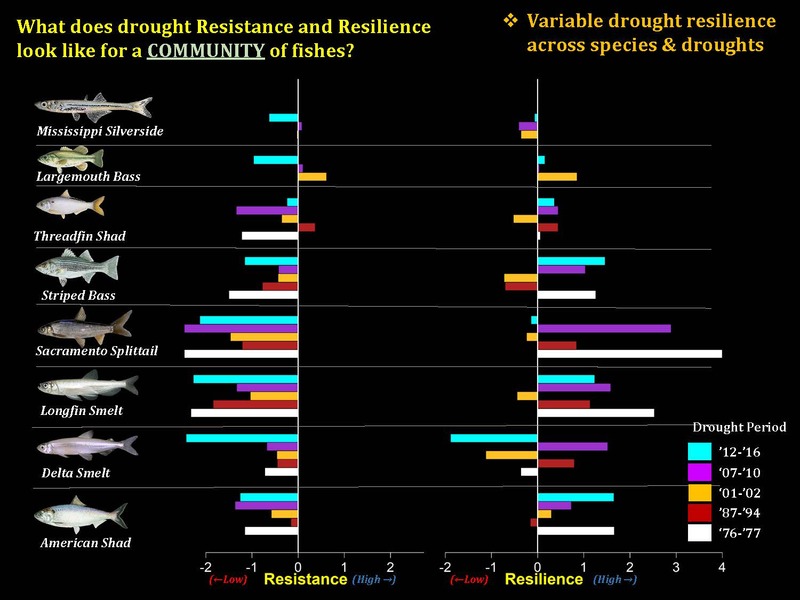 Dr. Conrad presented a slide from a previous IEP synthesis effort that used multiple datasets to look at how water quality and biological communities changed during drought over the last ten or fifteen years. “We noted that the ammonium concentration was increased during drought periods, catches of largemouth bass and silversides were enhanced, and that zooplankton densities were lower compared to wet periods, so that tells us something about what happens during drought,” she said. There are a numerous ways to look at this. 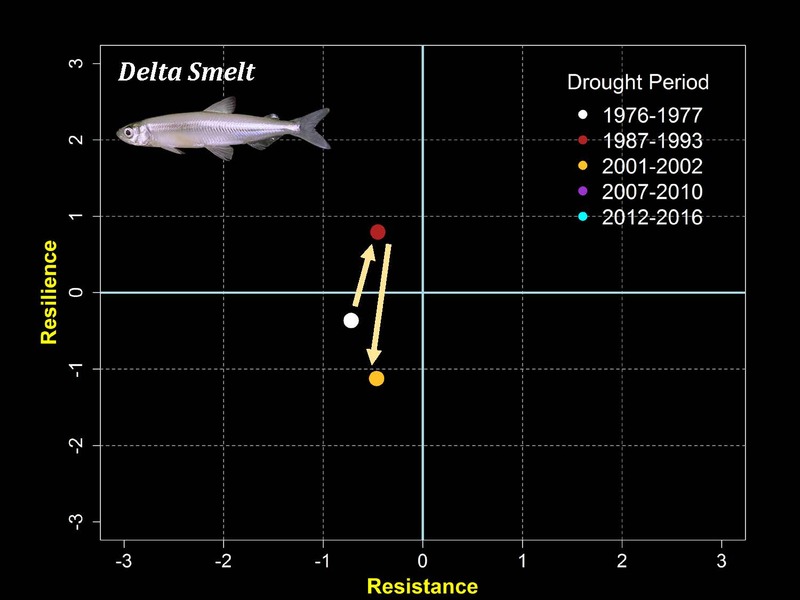 A lot of different data is collected on all sorts of different parameters in the system, so for this analysis, they chose to look at fish communities, including the smelts, some non-native fishes, and non-listed native fishes such as the Sacramento sucker. 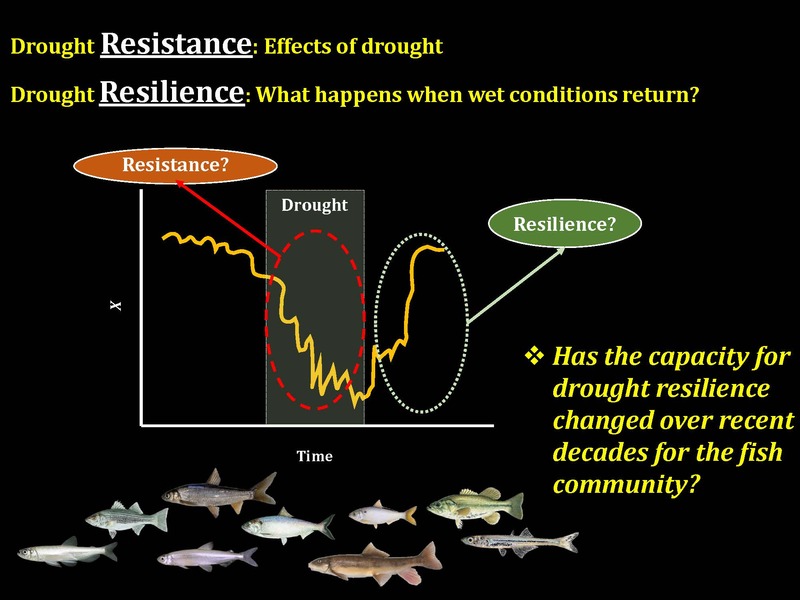 They wanted to know how the capacity for drought resilience has changed over recent decades for the fish communities. 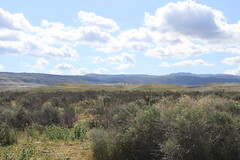 In order to do the analysis, the researchers needed to define what drought is and at what point they should start looking for resilience, and to know that they needed to know when the drought ends, which is not easily defined. The easiest place to start was the water year index, and so they decided to define drought for this analysis as two consecutive periods of dry or critical conditions. 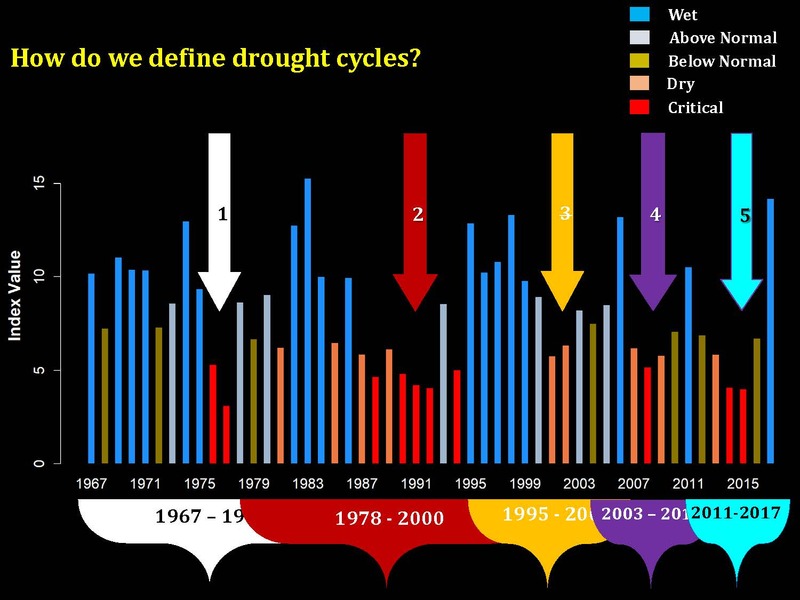 Looking at the graph, there are five different droughts using this analysis. The pre-drought period can be defined as all the period of wet conditions before the consecutive years of dry conditions; the post-drought can be defined as when wet conditions return until there are more consecutive years of drier critical conditions. While that might seem obvious, they did want to check, so they considered other parameters. Dr. Conrad presented a slide that shows outflow for two example water years that were different, water year 2017 and water year 2015. 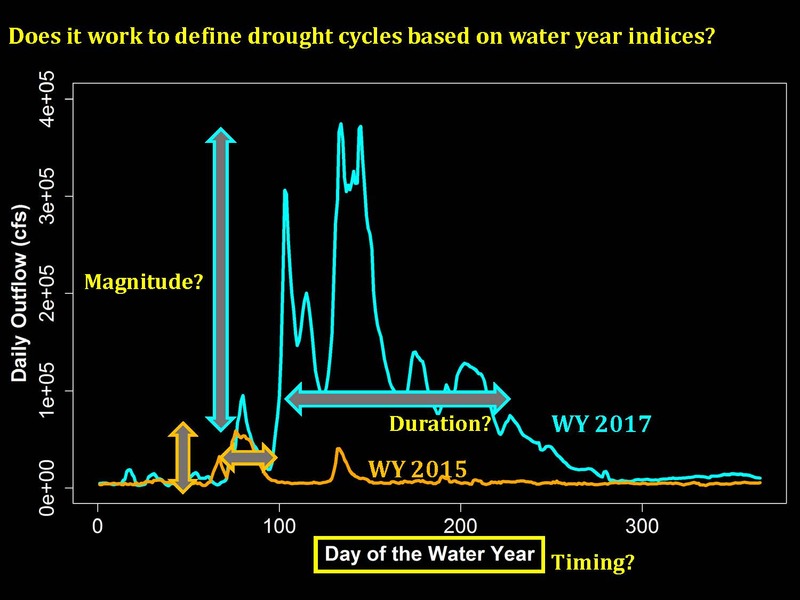 So they came up with various metrics using the Dayflow database to describe magnitude, duration, and the timing of any given water year, whether it’s drought or a wet year. They then compared those metrics to the drought cycles as they identified them, and the results were comparable. 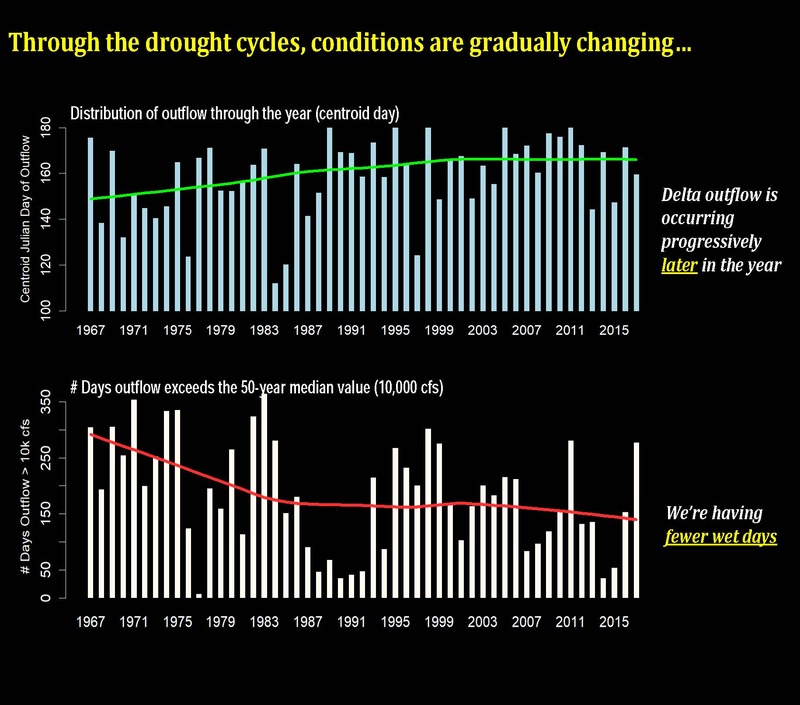 Dr. Conrad noted that the conditions themselves through the drought are changing, so they also looked at other metrics that describe timing and the magnitude of water years over the 50-year time series from 1967 to 2017. Are there directional monotonic trends that are occurring over this whole time series? “This is something to keep in mind as we think about things like resilience, that during this whole period, the communities we are looking at are experiencing this on some level,” she noted. Not only are the conditions are changing but fish communities and habitat are also changing as well. Dr. Conrad presented a slide showing a time series of the average catch per tow of longfin smelt for the years 1967-2017; she pointed out the shifting baseline. 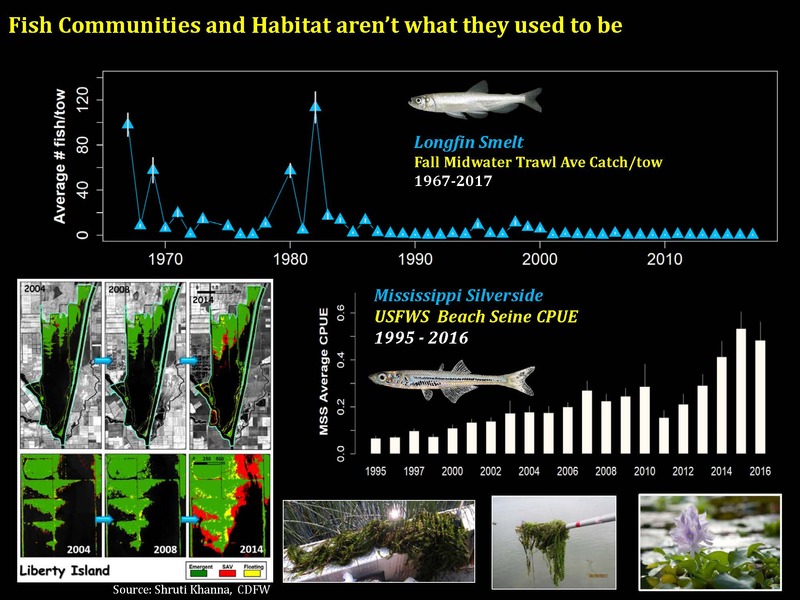 She also noted that the bottom graph shows the catch per unit effort for Mississippi silverside (a non-native species) in the US FWS beach seine since 1995, pointing out the increase in the catch. The research team needed to find a way to analyze and compare drought conditions to post-drought conditions with a metric that was comparable through the drought cycles. The found a paper that looked at bird communities in a region of Australia during their severe drought in somewhat of a similar way that scientists look at the Delta’s fish communities. The Australian researchers come up with a set of metrics using a Bayesian model that takes into account variation in sampling efforts and variation in the likelihood of occurrence across different time series such as a shifting baseline, and plots a resilience index and a resistance index, which is the likelihood of observation pre-drought compared to the drought. The research team then applied that to the data on Delta fishes using the Fall Midwater Trawl and US FWS Beach Seine datasets. Dr. Conrad presented an example plot from the 2001 to 2002 drought. 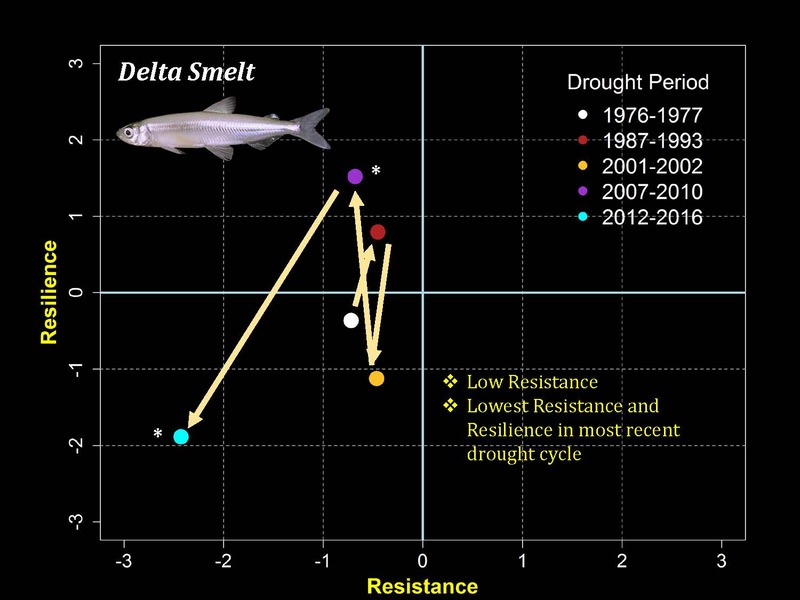 Dr. Conrad noted that they also looked at how the resilience capacity is changing over many droughts, so she presented a series of slides for the Delta smelt through all five of the droughts that they looked at. She noted that the recovery from the 1987 to 1993 drought was better than it had been after the 76-77 drought, then the next drought cycle, it was down in the quadrant of more population decline, back up in 2007 to 2010, but the recovery was one year; 2011 it was a colder year and they did well, so there is resilience there; and then with our most recent drought that occurred 2012 to 2016, the smelt are in the lower quadrant with the recovery or the resilience not favorable for the species. The researchers then looked at a community of fishes. Dr. Conrad presented a bar graph with the metrics on the side. Dr. Conrad said that she didn’t put error bars on the previous graphs as it would have been likely undecipherable, but the team did want to know if any of these cases where there are big bars of resilience that look hopeful, but is that different from zero? 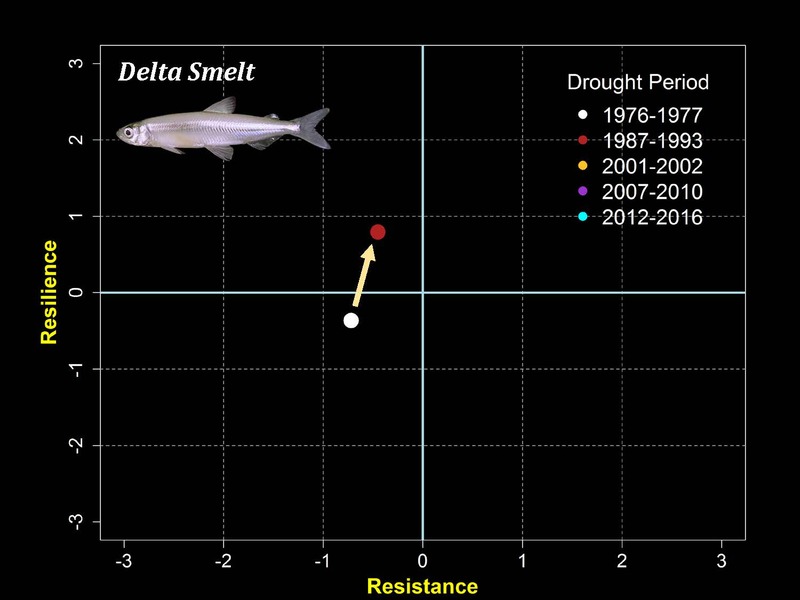 If it’s not, Dr. Conrad said that they can’t say with confidence using this analysis that there was a strong bounce back of that species during the wet period. 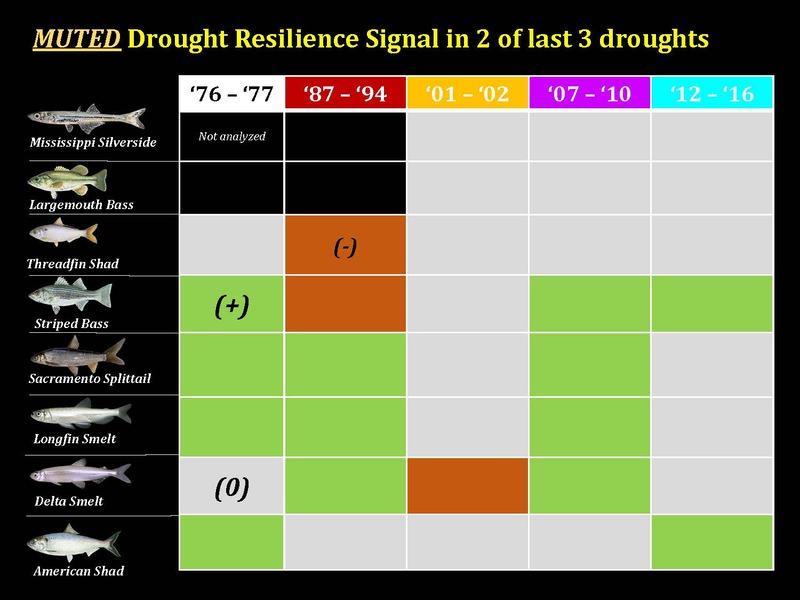 She presented a table which showed their confidence intervals for each of these droughts, noting that where they did see a real positive resilience are shown in green, and where there was no signal of a clear resilience, those are shown in gray squares; and if its reddish brown, there wasn’t good resilience and the index was negative and different from zero. Black squares meant that they didn’t use the data for those drought cycles because there wasn’t consistent sampling across stations. Visit the Interagency Ecological Program online by clicking here. 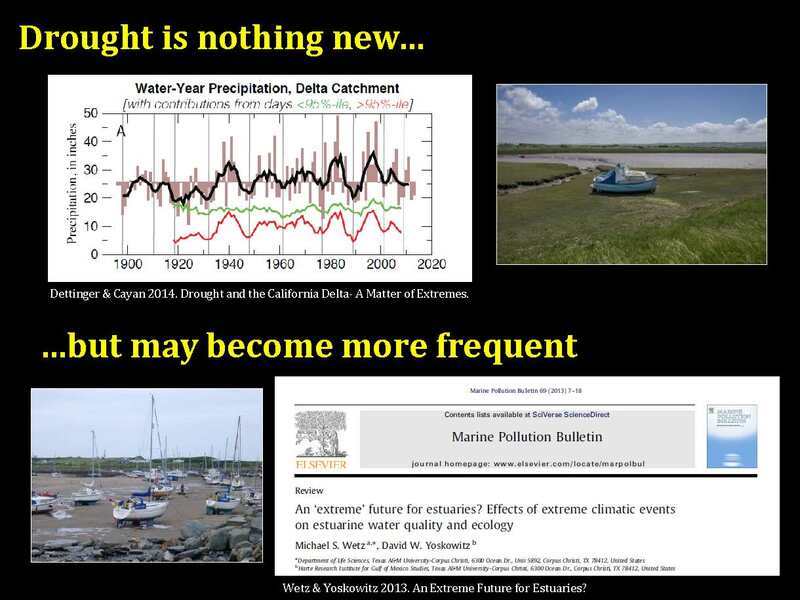 Click here for more presentations from the Bay Delta Science Conference.